SL-17 Kowa Slit Lamp - Dan Scott and Associates, Inc.
Now, an extra-handy slit-lamp microscope that gives a new degree of unrestricted patient accessibility. Rechargeable, cordless power supply for slit-lamp examination anywhere. Compact and lightweight, the examiner can hand hold the unit over a long period with minimal fatigue. Light switch is turned on when the examiner grasps the slit-lamp. Extra-bright halogen lamp light source. Easy, simple selection of one of three slit widths or spot illumination. Quick, one-touch selection of 6x or 10x magnification. Stand doubles as a battery recharger. 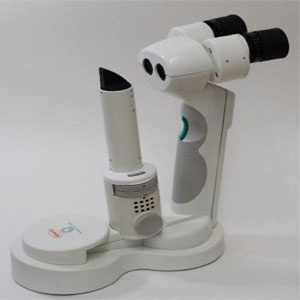 Power supply stand will accommodate recharging of both the slit-lamp and optional extra rechargeable battery. When both the slit lamp and battery are mounted simultaneously the slit-lamp will have charging priority.